The Fine Arts Department is preparing three stages at Sanam Luang ceremonial ground to organize public performances for the Royal Cremation Ceremony of His Majesty the late King Bhumibol Adulyadej. Various forms of art and entertainment at the ceremony, called “Ok Phra Men,” in the Royal Cremation are an age-old tradition. They are intended to pay a final tribute and farewell to the former monarch. The programs are also meant for the general public and to mark the ending of an official mourning period at the same time. In the Rattanakosin period, public performances took place for the first time during the Royal Cremation of Somdet Phra Pathom Borommahachanok, the father of King Rama I, in 1796. Culture Minister Vira Rojpojchanarat said that the Ministry of Culture had been assigned to organize the various entertainments, which will start at 6:00 p.m. on the Royal Cremation Day, 26 October, and run through 6:00 a.m. on the following day. More than 3,000 performers will join the shows. National artists will also take part in the programs. The khon masked drama will be performed in front of Phra Thinang Songtham, or the Royal Merit-Making Pavilion, near the Royal Crematorium. There will be 300 performers. 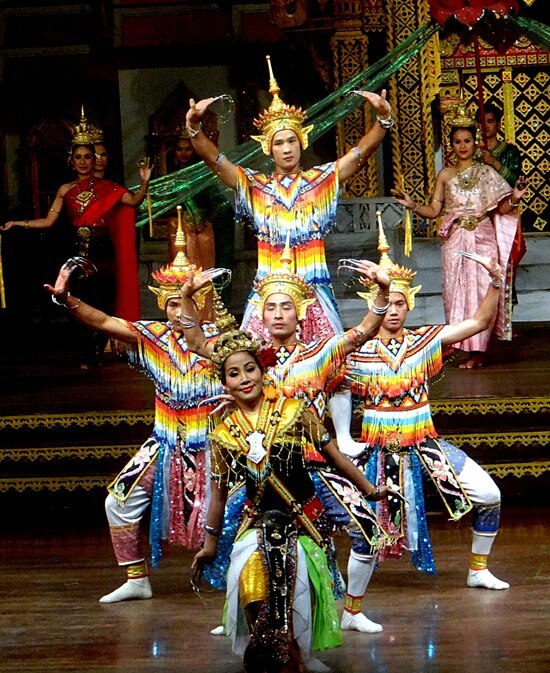 Khon is a classical masked dance derived from Indian temple rituals and dances and draws its story line from the Ramakian, the Thai version of the Indian epic Ramayana. As for public performances, they will be shown on three stages, located in the northern part of Sanam Luang. Stage One features nang yai, or great shadow play, and the khon masked drama, based on the Ramakian. The khon performances begin with the reincarnation of Lord Rama, up to the final episode of the Ramakian. There will be 1,420 performers. Stage Two features hun luang and hun krabok, which are puppet shows. They will include the Story of Mahajanaka, Inao (a romance with a Javanese background), and Manora (the southern traditional performing arts). There will be 422 performers. Stage Three features orchestras playing songs composed by His Majesty King Bhumibol and other songs in honor of the late King. They will be performed by several bands from such agencies as the Government Public Relations Department, the Royal Thai Police, and Chulalongkorn University. There will also be a ballet performance inspired by the story of Manora. Singers, musicians, and performers will come from A.S. (Ambara Sathan) Friday Band and Sahai Pattana Band, as well as other bands from many agencies and institutes. There will be 942 musicians, singers, performers, and other relevant personnel.